Marriott International, Inc. introduces Fairfield by Marriott Surabaya, the first Fairfield property in Indonesia. 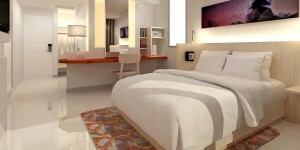 The new hotel is a significant milestone of the brand’s expansion into the midscale hotel segment in Indonesia. As a leader in the moderate-tier category, the Fairfield by Marriott is dedicated to value minded and momentum seeking travelers. Its brand’s 100% guarantee promises guests a stress-free stay to support productivity and maintain balance. Fairfield by Marriott is located in a new development area in West Surabaya, easily accessible to a main highway to accommodate travelers who are commuting to the outlying industrial estates from the city center. In proximity to one of the city’s key business areas, the hotel offers 270 guest rooms and suites with modern design and comfortable workspaces to accommodate work and play. The all-day dining restaurant, ‘Kava’, serves Indonesian and Western cuisine in both buffet and a-la-carte options where guests can relax while enjoying the city view. And ‘Kava Bar’, where guest can enjoy cocktails, mocktails as well as fine spirits. The hotel also provides corner market for guests to have convenient access to drinks and snacks. Fairfield by Marriott Surabaya has space for meetings and events, with more than 1,100 sq.m. of function room space that come with natural daylight. In addition the hotel also features spa, fitness center and an outdoor rooftop pool with beautiful city view which are perfect for guests to restore and rejuvenate.